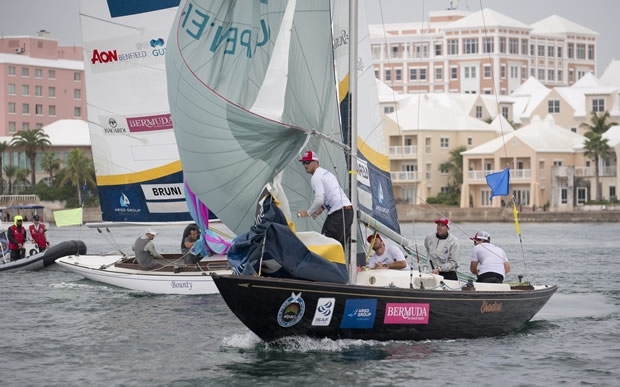 English conditions prevailed on Hamilton Harbour today as a trough passed over Bermuda bringing with it ultra-light winds and drizzly rain for the Semi Final round of the Argo Group Gold Cup, the penultimate round of the Alpari World Match Racing Tour. Matters were made no easier for the Race Committee when in the middle of proceedings, the wind turned inside out and there was a 180° wind shift. As a result only the first flight of Semi Finals racing was sailed. Racing got underway with the races to determine fifth to eight place. These culminated with Bjorn Hansen’s eWork Sailing Team coming out on top after beating Keith Swinton’s Black Swan Racing and Ian Williams’ GAC Pindar teams. The conditions resulted in a game of snakes and ladders across all the matches. In his one against Swinton, Hansen was ahead by four to five boat lengths, but conditions were so light on the right that the Australians were able to come back into them. Swinton went on to dispatch Phil Robertson in the inter-Antipodean dust-up to decide seventh and eighth places, where his Aussie team came out on top. “We managed to keep good speed in the boat in the pre-start and he went back to the line a bit early and we had some speed and that was that,” said Swinton of how that panned out. Meanwhile Hansen went on to beat Ian Williams in the match to establish the fifth and sixth placed finishers. Williams was still bemoaning his team’s Quarter Final performance yesterday, where, having come out on top in Qualifying and picking Taylor Canfield as his opponent, he then lost to the US Virgin Islander, 1-3. After the massive wind shift and a delay, the Semi-Finals got underway. Ben Ainslie’s team got the better of Adam Minoprio’s Team Alpari FX. “It was very frustrating,” recounted Minoprio. “The wind was light and shifty and as soon as the gun went it got even lighter and shiftier to the point where it was almost a bit of a drift-off.” Ainslie got the right out of the start and proceeded to extend away from there, with the Kiwi team having no chance to get back into the match. The first Semi Final race between Francesco Bruni’s Luna Rossa team and Taylor Canfield USone was a nail biter with the Italian team just pipping the US Virgin Islander to the post. With the forecast for the breeze to fill in to 10-12 knots from the northeast, the plan for tomorrow is to complete the Semi-Finals races before going into the Finals. Meanwhile the Alpari World Match Racing Tour card holders are contemplating what effect the Argo Group Gold Cup results will mean for the leaderboard going into the final event of the 2013 circuit, December’s Monsoon Cup. With Ian Williams being knocked out in the Quarter Finals, Taylor Canfield looks set to become the new leader of the 2013 Alpari World Match Racing Tour.